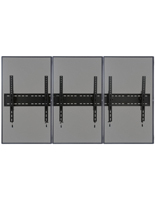 Showcase menu items, merchandise, or important information on digital displays with this 4-monitor wall bracket. 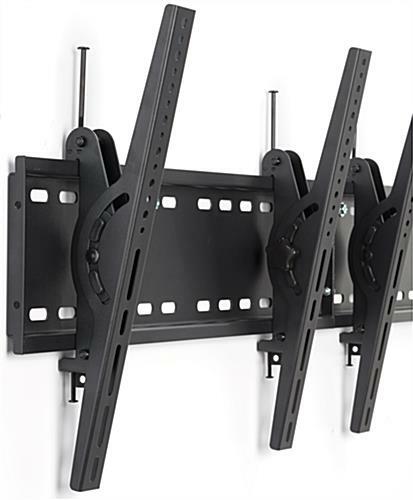 The black mounting arms are capable of holding four screens with a maximum capacity of 354lbs and sizes ranging from 30” to 60”. 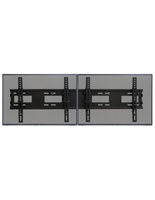 Each VESA compatible wall bracket can accommodate most modern flat panels with the included hardware. Tiltable mounting arms offer a pleasing view to passersby with the ability to adjust the view without having to dig out your tool box. 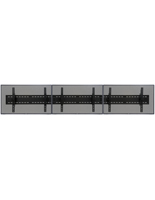 Additionally, the brackets can move across the black backing to align your display’s borders for a seamless look. 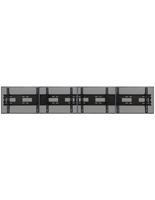 Modernize your business with this television fixture that allows you to showcase custom menus, advertisements, or customer needed information. 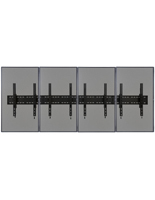 142.0" x 18.1" x 3.0"
The mount allows for great flexibility as well as ensures monitor alignment. Only issue found to date is with small screen sizes...had to install a menu board run with 32" monitors and found the brackets were larger than the TV profile. 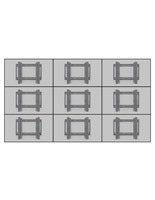 Simple cut and solved, but be aware of this if used with smaller monitors. Thank you so much for taking the time to leave this great review, Jared! We're glad that this TV mount was well-suited for your menu board, and we appreciate your feedback about the size of the brackets. We'll forward this along to our product development team for review. Thank you!